Silhouette roughly the basic outline of the garment or outfit, typically represented as a single color such as black. An example of silhouette that is common in everyday situations is when a woman is referred to have an hourglass figure which means that they have large breasts, small waist, and a large rear. Another example for males is the v-shape or a swimmer's body where a person has large lats that tapers down into a solid abdomen. Notice that both involve only the outline of the person and removes any sort of embellishment or depth. Think of it as representing the 3D body in a 2D plane. Since all clothing fundamentally requires an interaction between body and cloth, silhouette is an important part of clothing. With silhouettes, we typically speak of contrasts or continuity, in that a heavy silhouette should be offset by a tight silhouette unless the silhouette is extremely heavy which requires a continuity of heavy silhouettes. Generally, the point is that the inverse of A must be used to balance A unless the visual weight of A permeates the whole outfit in which A must pervade throughout the whole outfit. This may sound confusing at first, but hopefully a couple of examples should clarify this thought. In this guide, we shall be discussing silhouettes in terms of direction and weight. With direction, there are horizontal and vertical silhouettes and with weight, there are heavy and tight silhouettes. The silhouette of an item is typically grouped with a direction and weight, so there are four types of silhouettes which shall be discussed in this guide - heavy horizontal, heavy vertical, tight horizontal, and tight vertical silhouettes. First, let us define what a heavy silhouette is. A heavy silhouette is any silhouette that extends the natural silhouette of the body either horizontally or vertically. The natural silhouette of a person would be their naked body represented in a flat 2D plane. Take the right image as an example of a typical natural silhouette. A garment that gives a heavy silhouette would twist or even distort this natural shape by adding shapes atop the wearer. As discussed earlier, there are two types of heavy silhouettes - the heavy vertical and the heavy horizontal. We shall first begin a discussion of the heavy horizontal silhouette. A typical example of this would be something as basic as a puffer jacket. 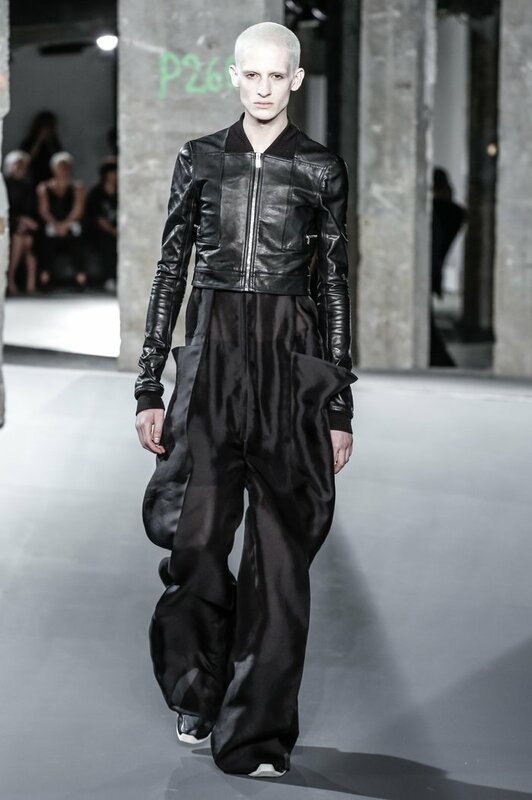 The puffer jacket extends the silhouette of the wearer horizontally by adding blobs of fabric atop the skin. 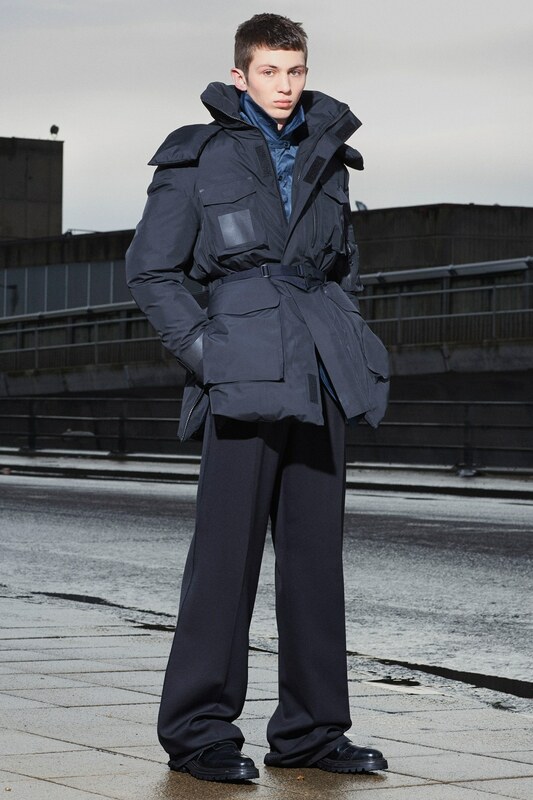 Typically, garments with heavy horizontal silhouettes tend to be found in functional garments that protect the wearer from the elements such as the aforementioned puffer jacket. This is due to the nature of protective garments being fabrics added atop the human body to protect it from outside forces. Another common example would be a military bomber jacket. Bulky tends to be the descriptor used for this type of silhouette. Asides from heavy horizontal silhouettes, there are also heavy vertical silhouettes which similarly extend the shape of the wearer but this time vertically rather than horizontally. The dress is perhaps the most well-known example of this. Vertically heavy silhouettes tend to be heavily associated with ideas of elegance or movement as the dress is the chief garment associated with this type of silhouette but also due to the fact that vertically heavy garments tend to react to the body the most compared to horizontally heavy garments which add fabrics atop the body. Since by definition, vertically heavy garments extend the wearer's silhouette vertically through fabric and movement is primarily a horizontal phenomena, movement, specifically the movement of the fabric with relation to the wearer, then becomes associated with vertically heavy garments and with movement comes elegance. That being said, tight silhouettes are the inverse of heavy silhouettes. They emphasize the wearer's natural silhouette rather than extending it in various forms. They stick close to the wearer's skin. Athletic wear is a great example of this with tights being used for numerous sports largely due to not wanting to inhibit the athlete's range of motion. Skinny jeans are also an example of this type of silhouette. However, it should be noted that athletic wear and skinny jeans are nearly polar opposites of each other in how much they allow the wearer to move and this is a function of the materials used between the two types of clothing. The function of materials with relation to silhouettes shall not be discussed in this section but may be covered in a future guide. With heavy silhouettes, we noted that heavy horizontals is associated with bulkiness and heavy verticals with movement. What about tight horizontals and tight verticals? Tight horizontal silhouettes is simply any garment that sticks as close to the skin as possible. An example of these are the aforementioned skinny jeans and athletic wear. A high degree of eroticism and sexuality is associated with these type of silhouettes for the simple reason that it reveals an idea of what is under the clothes but not necessarily physically reveals it. There is this element of boastfulness to the garment but also a degree of restraint as skin is not outright shown, which seems to only heighten the sexual factor. It is no wonder that people living in excess wear this silhouette so frequently, such as stereotypical celebrities and rock stars. The next type of silhouette is the tight vertical silhouette. Perhaps the most noticeable example of these are cropped items such as cropped pants or jackets. These outright reveal skin or more generally what is under the garment. Vertically tight silhouette tend to have an effect of cutting that part of the wearer short. So, wearing cropped pants gives the illusion of one's legs being shorter than it is. This may prove useful for people who have unnecessarily long legs or too short of a torso. The same idea goes with cropped jackets. Now, recall the earlier statement that silhouette is all based on continuity. A heavy silhouette should have a fully heavy silhouette from top to bottom. Examples can once again illustrate this point. Take this (http://i.imgur.com/uhjdMbR.jpg) example. We see the wearer have this extremely heavy jacket with shapes protruding from all sides be contrasted with pants that stack heavily on the feet, giving it an almost flaring silhouette to it. This is all coupled with a pair of thick-soled derbies. Consider if the wearer had worn some leggings and perhaps running shoes with this outfit. It would be clear that the person would look goofy as our eyes would find the contrast extremely jarring. Another example of extremely heavy silhouettes, but this time vertically, would be this (http://assets.vogue.com/photos/55c6510308298d8be219ee02/master/pass/_ON_0230.1366x2048.JPG). However, heavy silhouettes can be paired with tighter silhouettes so long as the weight of the silhouette does not extend the body in extreme ways. Notice how in this (http://i.imgur.com/eYwBt9X.jpg) example we see a very vertically and horizontally tight jacket contrasted with the heavy silhouette of the pants. 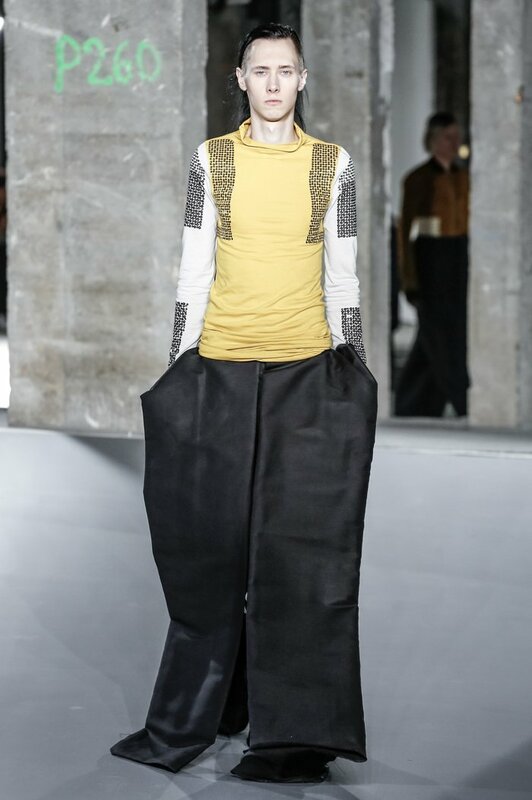 The transition here is not jarring in the slightest as the pants tend to extend its silhouette horizontally during the end of the pants rather than in the beginning. Extremely heavy silhouettes contrasted with tight silhouettes can look weird in real life, with this (http://i.imgur.com/SNTl3nu.jpg) as an example. I would however say that since those outfits were shown in a runway show, it is permissible to an extent. The ideas of silhouette can easily be extended when making fits on the looser spectrum (something which the board seems to be circlejerking on). Either go on a full-on heavy silhouette with fabrics that hang off the body or add some much needed contrasting. Same goes with tighter fits. The key idea to bring out of this guide is to achieve a balance between the tight and heavy and the horizontal and the vertical. Too much of one from each side causes the outfit to look downright laughable at most cases and sloppily put together. However, if one chooses to sway to one of the four basic silhouette types, it is advised to stick to that same silhouette for the whole outfit at all costs in order to prevent any jarring visual changes. Continuity is key in silhouettes and these four types can help you, the wearer, grasp this concept better. This page has been accessed 139,121 times.